One of the nicest veal recipes you will find, this braised veal with pearl onions is from a wonderful cookbook called Slow Cooker Comfort Food: 275 Soul-Satisfying Recipes . 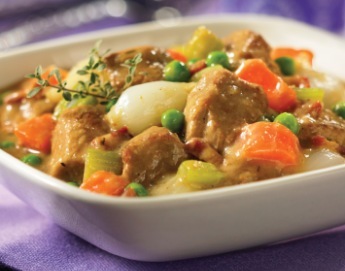 Here veal is braised in white wine and chicken stock to produce a richly satisfying yet surprisingly light veal stew. 1. In a skillet, heat 1 tablespoon of the oil over medium-high heat. Add pancetta and cook, stirring, until browned, about 3 minutes. Using a slotted spoon, transfer to stoneware. Set pan aside. 2. On a plate or in a plastic bag, dredge veal in flour until evenly coated. Return pan to element over medium-high heat. Add veal, in batches, and brown on all sides, transferring to stoneware as completed and adding more oil if necessary. 3. Reduce heat to medium. Add remaining tablespoon (15 mL) of oil to pan. Add carrots and celery and cook, stirring, until softened, about 7 minutes. Add garlic, thyme, salt, peppercorns and bay leaves and cook, stirring, for 1 minute. Add wine, bring to a boil and boil for 2 minutes, stirring and scraping up brown bits from the bottom of the pan. Add stock. Return to a boil. 4. Transfer to stoneware. Stir in onions. Cover and cook on Low for 8 hours or on High for 4 hours, until veal is very tender. Add peas and cook on High about 10 minutes, until tender. Season to taste with pepper. If desired, add a drizzle of cream. If you are halving this recipe, be sure to use a small (approximately 1 1/2 to 3 quart) slow cooker. Use a medium to large (3 1/2 to 5 quart) slow cooker for this recipe. To peel pearl onions, cut an “x” in the root end and drop them into a pot of rapidly boiling water for about 30 seconds. Drain in a colander and run under cold running water. The skins should lift off quite easily with a little prodding from you and a sharp paring knife. Complete Step 3. Cover and refrigerate for up to 2 days. When you’re ready to cook, complete the recipe. Veal recipes may not be for every day, but they are a delicious treat. You will definitely want to try this one. The author serves this with a simple risotto – one made with just onions and chicken stock and seasoned liberally with black pepper – for a delicious meal. 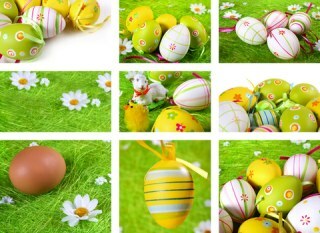 Look here for veal recipes, chicken, turkey, ham, lamb and pork.